If you or someone you know is trying to shed pounds past the age of 50, you or your pal may be running up against a whole new set of roadblocks. To get the scoop on how to outsmart Father Time, we talked to a couple of our favorite health and fitness professionals: health journalist Robert J. Davis, Ph.D., and personal trainer Mandee Miller! Don’t shy away from weight training! Mandee recommends resistance exercises 2 - 4 times a week, to help with muscle mass. She says, “Muscle is important because it helps preserve and maintain healthy bone density... It’s also a key component to our metabolic process -- how we use food as energy, a.k.a. fuel.” In other words? Working those muscles can actually help you to burn more calories. Just starting out? Begin with bodyweight exercises, such as squats and sit-ups. These exercises require no equipment whatsoever, and they strengthen real-world activity skills, like easily bending and getting back up. More from Mandee: Try "free weights, resistance tubing and bands, medicine balls... in a class setting for guidance, form correction, and a second pair of eyes to ensure you are building good strength training habits." If you can't get to a class in person, look up videos on YouTube or a fitness app, and follow along at home! What About Running? Robert J. Davis is for it. "Contrary to popular belief, running does not wreck your knees according to research. In fact, runners tend to have a lower risk of joint problems than non-runners, perhaps because running strengthens muscles, which means less pressure on joints." Robert says, "If you walk, instead of going at a steady pace for, say, 30 minutes, walk as fast as you can for 20 - 30 seconds, then go at a moderate pace for 30 - 60 seconds. Go fast for another 20 - 30 seconds, then at a moderate pace, and so on, for a total of at least 20 minutes." Great way to push yourself without going overboard! ⭑ Talk to your doctor before starting an exercise program. The pros are there to help you! ⭑ Take it easy at first. Increase your time and intensity as you get stronger, but don't overdo it. And if it hurts: STOP. ⭑ Flexibility is another area to work on. Include stretching, yoga, and/or tai chi to increase mobility, ease stress, and relieve pain. ⭑ Eating enough protein is crucial for building muscle; lucky for you, we have a ton of recipes full of lean protein! Looking for More No-Brainer Calorie Burners? 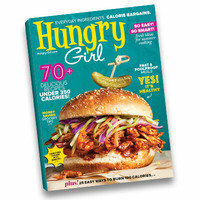 We've got 25 simple suggestions in the Summer issue of Hungry Girl magazine! 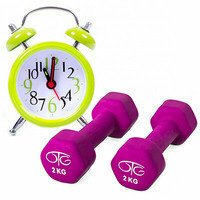 Each one burns 100 calories and can easily be incorporated into your daily routine! Find the magazine in stores like Walmart, Kroger, Albertsons, Safeway, Publix, Target, Whole Foods, and Barnes & Noble. Or order your copy now with free shipping... But hurry, because there are only a few hundred copies left! Check out Robert J. Davis's books on Amazon... All three are EXCELLENT! Mythbusting, motivation, and so much more! 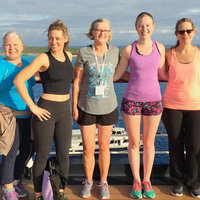 Visit Mandee Miller’s website to learn about virtual fitness coaching, check out her workout playlists, and connect with her on social media. Yay, Mandee! HG Heads Up: There will be no email this Monday, 5/28, in honor of Memorial Day. But we’ll be back on Tuesday with a SUPER-EXCITING carb-slashed recipe! Happy National Brown-Bag-It Day, May 25th! Have you tried salad in a jar yet? Surely you know some pals who could use these tips… Click "Send to a Friend" now!